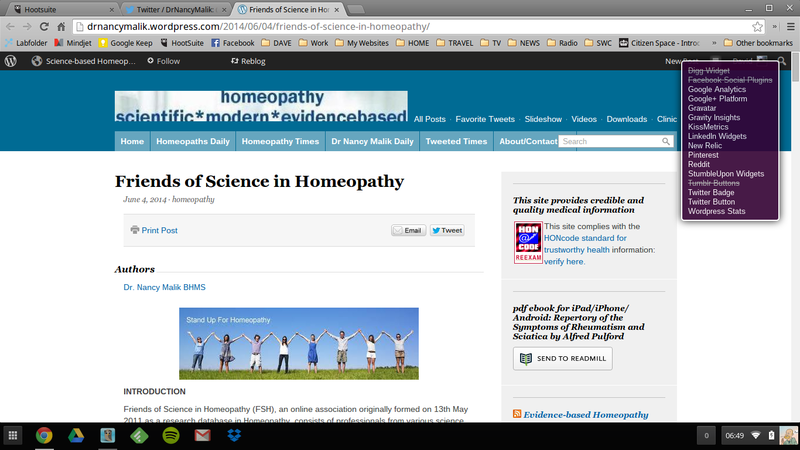 …guess which US homeopathy advocate is still flogging one of their products on his website? Basically – they don’t manufacture their remedies in a controlled and consistent manner, and they cannot monitor this because it’s homeopathy, there’s nothing to monitor they don’t maintain the equipment for doing so in the correct and proper fashion. If this was a real drug company, the implications could be disastrous. If one in six packs of antibiotics was duff, you can bet that we’d hear about that and there would be huge fines levied all round. One wonders if users of the duff batches of remedies noticed the lack of “powerful gentle natural effective” homeopathic active ingredient, and promptly complained to Nelsons about this? This failure to adhere to best practice has landed Nelsons on the FDA red list [Link – scroll down to United Kingdom] – “Detention Without Physical Examination of Drugs From Firms Which Have Not Met Drug GMPs” – it seems (from my reading of this notice) that Nelsons cannot export their goods to the US, and if US customers officials discover people bringing Nelsons products into the US they are to confiscate the goods. This will clearly have a negative impact on their US exports, and Nelsons are clearly rather proud of their export success [Link]. NB. Nelsons also make the Prince Charles’ Duchy Orignal line of herbal remedies [Link – Warning – Daily Mail]. So, can Nelsons products be sold in the US? Clearly the FDA might have something to say about the “Good Manufacturing Practice (GMP) and rigorous procedures”. However, as Nelsons homeopathic products are manufactured in Wimbledon, UK, it follows that any Nelsons products sold in the US must have been imported. I don’t imagine that the FDA red notice acts retrospectively, but obviously, as we are repeatedly told that “homeopathy is exceedingly popular and therefore it must work” 🙂 – one imagines that US stocks of Nelsons goods will soon run dry. I invite you to keep your eye on this page [link – warning – may cause nausea and temporary blindness ;)] to see when then this occurs. 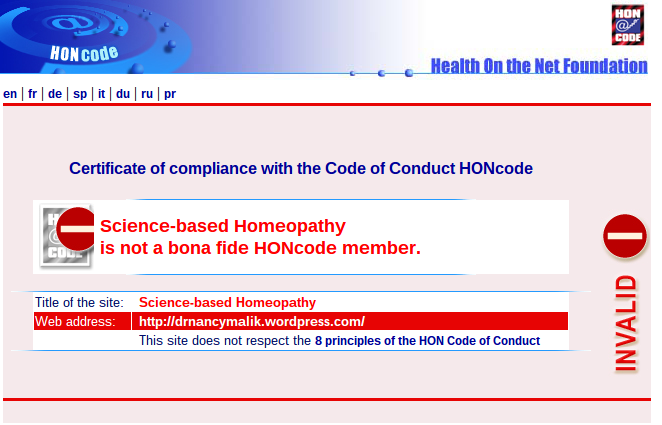 Obviously, such a high profile and conscientious homeopath will ensure that the information on his website will remain up-to-date and entirely responsible. Moreover, given the concerns about the quality of Nelsons goods, one wonders if said homeopath will stop supplying them, to avoid the stigma of being tainted by Nelsons new-earned reputation for poor quality goods. Quickie – Homeopathy for Radiation poisoning? A few quack websites (e.g. such as the one discussed here) have lept on the terrible events surrounding the earthquake and subsequent tsunami in Japan to make a fast buck off the backs of scared and vulnerable people. This one is no better than the others, but it couches and prefaces the descent to batshittery with some sensible advice about emergency planning and what have you. Bottled water and food for at least one week, preferably longer. A camp stove and fuel to cook with. Access to a computer if possible. Dust masks and protective painters coveralls. Homeopathic remedies stored in a lead lined film bag with information on how to use them. A family plan that everyone knows – where to meet, who to call. etc. The page then talks sensibly about some of the effects and symptoms of radiation sickness before plunging head first back into the woo, suggesting lots of homeopathic remedies for cancer. And fear of cancer. Cadmium Metallicum – For stomach cancer. Violent vomiting, loss of appetite and emaciation. Bright red bloody diarrhea. Blood changes, anemia, problems in the intestinal tract. Fatigue and lassitude like in influenza. Dull ache all over. Concentration difficult. Fear of Cancer. Indifference, does not want to see people anymore. Irritability alternating with deep depression. Cadmium Sulphuricum – Similar to Arsenicum Album. Cancer of the stomach. Persistent vomiting. Black vomit. Chief complaints are the stomach and breathing. Chilliness and cold even next to the fire. Restless. Gray complexion. Nause, retching with burning and cutting pains. Worse from motion. Cadmium Iodatum – Very similar to Cad Met but warmer. The Iodine component brings aggravation from heat or extreme cold. A distinctive mental trait is hatred and a high degree of self pity. Fluoric Acid – Affects the bones. Necrosis and bone decay. Deep acting in slow, progressive, destructive effects. Wants open air. Phosphorus – Affects mucous membranes, destroys bone, disorganizes blood and inflames nerves. Hemorrhages. Desires cold drinks. Suddenness of symptoms. Excitable and impressionable. Wants sympathy. Great fear creeping out of every corner. The human barometer. Profundly effects the nutrition and function of every tissue. Chronic effects of radiation exposure. Radium Bromatum – Effects nerves skin. Radiation burns. Destroys the nucleus of the cell. Severe aching all over. Pains suddenly shift, electric like pains. Joint pain and gout. Fear to be alone, wants company. Apprehensive, depressed. Cancer. Strontium Carbonicum – Effects the bones. Shock after surgery or loss of blood. Pains fleeting, can hardly tell where they have come from, felt in the marrow of the bones. Pains appear and disappear gradually also. Violent involuntary starts. Burning, gnawing pains. Great prostration. Anguish as from guilt. Angry, tendency to fly into a rage. Depression. X-Ray – Low vitality, chonic fatigue and sick feeling. Cancer. Skin burns and lesions. Affects the blood, lymphatics and bone marrow. Anemia, leukemia. Sadness. Aversion to company. It should go without saying that NONE of these remedies have any proven efficacy what-so-ever. The ‘potency’ is not mentioned, but it is worth repeating that there is no known mechanism of action for remedies that are diluted beyond 12C, i.e. those that do not contain any molecules of the original substance. Another sickening example of people pushing unproven quack remedies on scared and vulnerable people, much like the ‘homeopaths without borders’ incursion into Haiti, following the earthquake there. 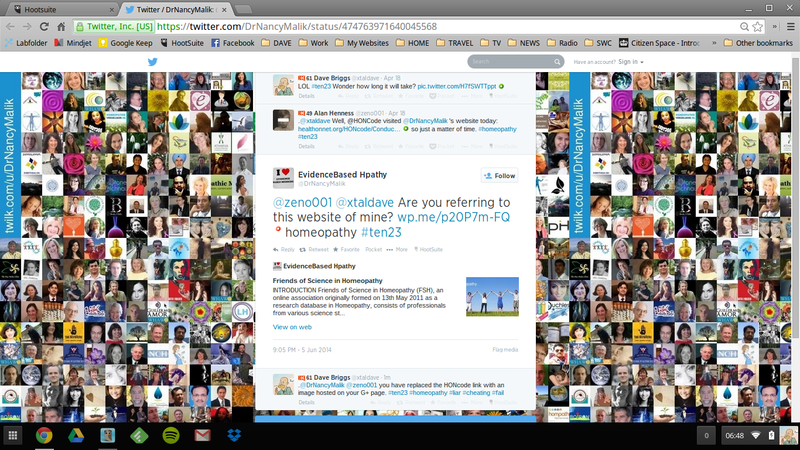 ASA swamped with complaints re: Homeopathy. 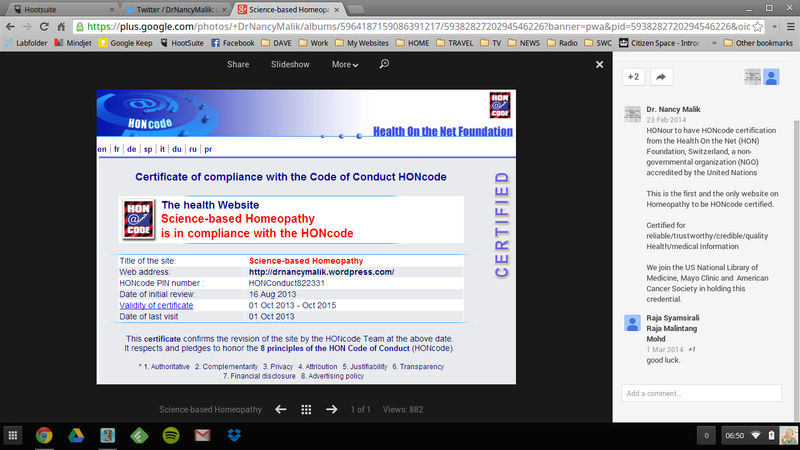 Quickie about a letter from the ASA to all who have complained about website with homeopathic levels of honesty. As you may or may not be aware, the Nightingale Collaboration has co-ordinated a campaign to highlight and complain about some of the ridiculous and unsupportable claims that alternative medicine practitioners make on their websites – the current project is targeting homeopathy websites within the UK. Thank you for your recent complaint. As you may know, the Advertising Standards Authority (ASA) has received over a hundred and fifty complaints about over a hundred different websites for homeopathy. Complaints cover a range of issues from specific claims made by individual advertisers to general concerns about the sector as a whole. Because of the volume of complaints, we are sending this letter to everyone who contacted us on these issues to let you know what action we intend to take. The ASA has an established position on claims that can be made, and those claims that are not likely to be acceptable for homeopathy, based on the requirements set out in the CAP Code and previous ASA adjudications. Although we have not historically received many complaints about advertising for homeopathy, the Code has general requirements for substantiation of claims in the health sector and the Committee of Advertising Practice (CAP) offers specific advice on marketing health-related products and services. Further information about the requirements of the advertising Code is available on our website www.asa.org.uk and from www.copyadvice.org.uk. 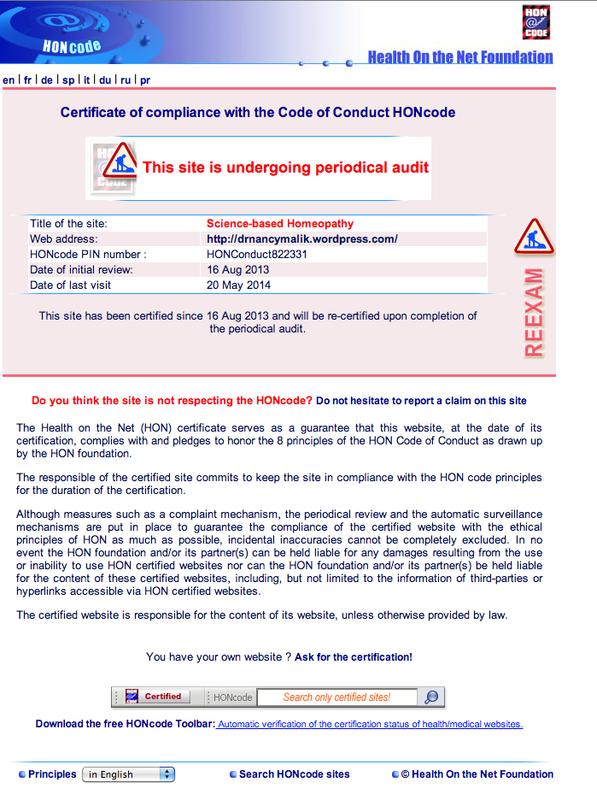 We are seeking to enforce compliance with the Code even-handedly across the sector by contacting all of the advertisers we have received complaints about as well as the bodies that represent homeopaths and homeopathy in the UK. We will be explaining the Code’s requirements, giving advice on how to ensure advertising claims do not breach the Code, and asking advertisers to remove any claims which do not comply. More information about what that means in practice is provided in the CAP Help Notes on Substantiation for Health, Beauty and Slimming claims and Health, Beauty and Slimming Marketing Communications that Refer to Medical Conditions. You can find these documents on our Copy Advice website, as indicated above. Because the ASA has only been regulating websites since 1 March many of the advertisers we contact will not be familiar with us or the work we do and will need help and assistance from us. For that reason, we plan to monitor compliance 3 months after making our expectations of them clear. We feel that this will give advertisers, some of whom are very small and have limited resources, sufficient time to make the necessary changes. The ASA will not be publishing individual adjudications on this occasion. We will however publish specific, up-to-date advice to the industry and its representative bodies in due course and we will work with them to ensure that advertising for homeopathy is compliant with the Code. Thank you for taking the trouble to contact us. While you will not see immediate results please be assured that we are working hard in the background to resolve the issues that have been complained about. First off it shows that the Nightingale Collaboration (NC) has been successful in co-ordinating a fair few complaints within the 2-and-a-half weeks it has been running this campaign – whether this number of complaints matches the expectations of the NC, only they know. It would appear that the ASA recognise that UK-based homeopaths are often making unsupportable claims about the efficacy of their sugar pills on their websites – to such an extent that they are going contact both the complained-about homeopaths and their ‘regulatory’ bodies (ARH, SoH, BHA etc) about these breaches, and make them aware of the rules that they should be adhering too. If after 3 months they have not complied with UK advertising regulations – the ASA may take further action. Whilst individual complainers may miss out on the satisfaction of seeing adjudications against the websites they have complained about – the end result should be the same – and in fact much more far reaching. This wholesale action against all UK-homeopaths (via their ‘professional’ bodies) by the ASA should ensure that they are no longer allowed to make outrageous claims about efficacy (or claim that they were unaware of the rules). Provided the ASA take a suitably tough line with the homeopaths, and they ensure that the rules are adhered to, I think that this can be seen as a very effective first strike by the Nightingale Collaboration. Today, as this blog is posted, I will be taking a massive overdose of homeopathic ‘medicine’. Unless the laws of chemistry, biology and physics momentarily lose their grip on our reality, the only thing that will happen is that the sugar in pills will enter my blood stream, via my digestive tract, and give me a mild sugar rush. The fact that these sugar-pills-dressed-up-as-medicine continue to be offered by persons acting on behalf of the (cash strapped and under funded) National Health Service, and are available from supposedly reputable high street pharmacies like Boots the Chemist is an affront to reason. The ten23 overdose is not (and was never) designed to be a scientific proof of the lack of efficacy of homeopathy – we rely on tried and tested methods like meta analyses to do that for us – rather ten23 is a public awareness exercise. If you feel moved to do so, follow @xtaldave for updates through out the day. You are currently browsing the archives for the Homeopathy category.